Leaving Sheffield on the A 57 ( towards Manchester) pass the Valleyside Garden Centre on your left hand side. You are now in open countryside. The road runs straight for approximately 400 metres, swings through an S bend and then straightens out again before bearing into a right hand bend.Blackbrook Farm is on the left immediately after the bend. Parking is on the bottom drive running parallel with the road. 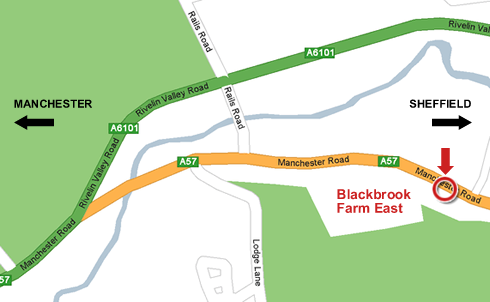 There is no access to Blackbrook Farm from Lodge Lane. Approaching Sheffield on the A 57 ( Sheffield City centre -5 miles ) pass a telephone box and public toilets on your left immediately after a left fork. Keep straight on. The road now begins climbing gently. Pass Lodge Lane on your right. Blackbrook Farm is the first property on the right. If at any point you pass the Valleyside Garden Centre on your right you have overshot and should turnaround. Parking is on the bottom drive running parallel with the road.